Q: Who needs Inlays and Onlays? A: Dental inlays and onlays are restorations used to repair rear teeth with mild to moderate decay or cracked and fractured teeth that are not sufficiently damaged to need a crown. Q: What are other benefits to Inlays and Onlays in comparison to metal fillings? • Inlays and onlays are durable — they’re made from tough, hard-wearing materials which last up to 30 years. • They help to strengthen teeth by up to 75 percent, unlike traditional metal fillings, which can actually reduce the strength of the teeth by up to 50 percent. • Inlays and onlays prolong tooth life and prevent the need for more dental treatment in the future. Q: When do I need it? A: Dental inlays and onlays are used when old fillings need to be removed or replaced. A dental inlay is similar to a filling and fits inside the cusp tips (top edges) of the tooth. A dental onlay is more extensive and extends over the cusps of the treated tooth. During treatment the dentist removes the old fillings under local anesthesia and takes an impression of the tooth, which is sent to the dental laboratory. 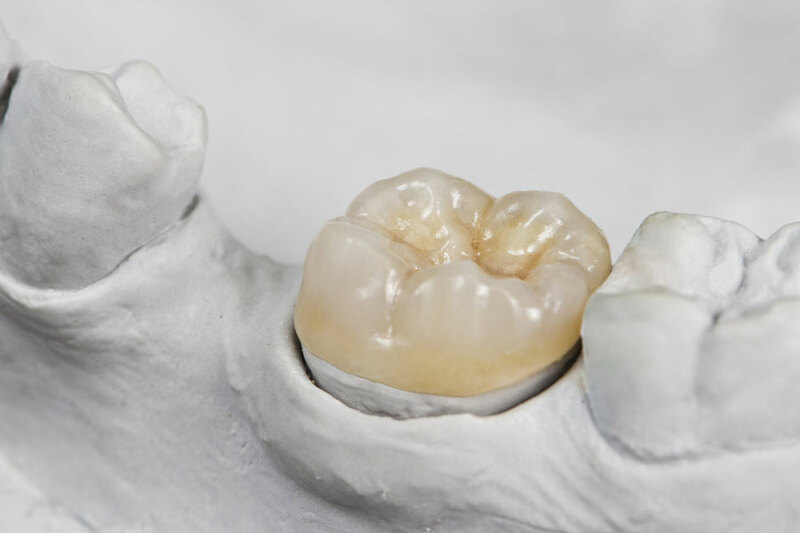 The new inlay or onlay is made from this mold in porcelain, gold or composite resin material. The inlay or onlay is then cemented into place at the next appointment. The inlay or onlay blends successfully with the treated tooth and the rest of the teeth to achieve a natural, uniform appearance. Q: How are inlays and onlays done? A: It takes two appointments for the inlays and onlays treatment to be completed and to be finally bonded to the damaged area of the tooth. Inlays and onlays are performed using very similar procedures. At the first appointment, your dentist begins the procedure by numbing the area to be treated with local anesthetic or deep sedation for our special patients. Any decay or damage is removed by drilling, which cleans and prepares the tooth for the dental inlay or onlay. Using a small tray filled with dental putty that fits over the teeth, the dentist takes a mold (impression) of the damaged tooth. This impression is sent off to the dental laboratory, where a dental inlay or onlay is created that will fit your tooth exactly. Inlays and onlays are usually made from porcelain, which often most closely matches the normal color of the tooth, but they can also be made from composite resin or gold. While the inlay or onlay is being created at the lab, the dentist creates a temporary restoration (cover or filling) for your tooth to protect it until your next appointment. At the second appointment, your dentist will remove the temporary restoration and then take time to ensure the inlay or onlay fits correctly. Only when the inlay or onlay fits perfectly will the dentist bond the inlay or onlay to the tooth with a strong resin adhesive. The inlay and onlay treatment is completed with a polish to ensure a smooth and aesthetically pleasing finish. Each visit to the dentist for inlay or onlay treatment takes about an hour, with the first appointment taking slightly longer due to the preparation process. A: There will probably be a little discomfort after the inlay or onlay procedure, and the new tooth surface may feel a little odd, but you soon get used to the new tooth surface and how it feels and looks in your mouth. The tissue around the treated tooth may feel sore or sensitive, but this should subside in a couple of days. If you do feel some discomfort, you can take over-the-counter pain medication to alleviate the symptoms.